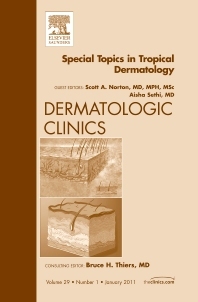 Tropical Dermatology is reviewed in this issue of Dermatologic Clinics, guest edited by Drs. Scott Norton and Aisha Sethi. Drs. Norton and Sethi have gathered a panel of experts to pen articles on topics including Buruli ulcer, Outbreaks of atypical mycobacterial disease, Streptococcal pyoderma and acute rheumatic fever, Treating MRSA in the tropics, Mosquito-borne hemorrhagic fevers, Dermatologic cases at the National Zoo, Arsenical keratoses, Chagas disease, The AAD's Botswana elective, Gentian violet and similar products used to treat pyodermas, Dermatology in Mali: Leishmaniasis, Albinism in Africa, Female genital mutilation, Use of toxic skin lightening compounds, AIDS and leprosy, and Innate immunity and anti-parasitic vaccine strategies.